My Favorite Thrift Find To Date! "I'm gonna pop some tags. Only got twenty dollars in my pocket..." I have this Macklemore song stuck in my head as I write today's post because I went thrift shopping and found my favorite thrift find to date! It's no surprise I'm a bargainista and I'm definitely, not shy to hit up a thrift store. A lot of people always ask me how do I find great goodies at a thrift store and honestly it's all about patience. If you don't have the patience to look through racks then thrifting might not be for you. Last month I went to New York for an event and before driving home I decided to do some shopping. I stumbled across a thrift shop to see what pieces I could find. I didn't have anything particular I was looking for but came across this gorgeous blazer. I'm a huge blazer fanatic because they are perfect for any season if you ask me. The cut and the style are very different and that's what attracted me to it. It was only $5.99!! The shoulder pads give it such an 80s vibe and I contemplated on taking them off but I've always loved 80s fashion. I always told my mom I was born in the wrong era because I always adored the Madonna and Cyndi Lauper looks. 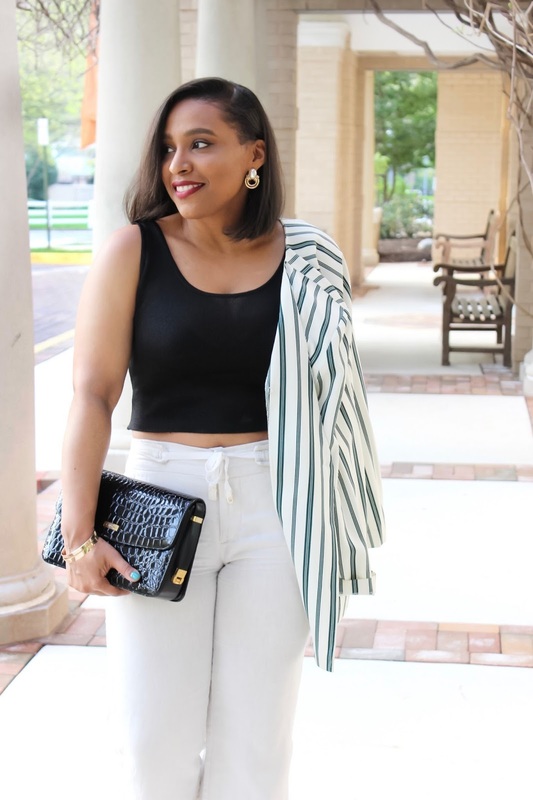 I definitely want to wear the blazer again and pair it with jeans but for this look, I went with linen pants and a crop top. Anyone else loves thrift shopping? Let me know what amazing finds you have found. I love hearing a good thrift story! Yur looks are always so perfect! You pay attention to every detail and I think that this is really important! I love your jacket, I really like stripes! I love your blazer babe, is so classic and pretty!